Is Your Online Data Safe? “But Facebook has multiple redundant cloud servers in state-of-the-art climate- and power-controlled data centers redundantly scattered all over the world!” you may say. True, but so what? Facebook or any other social media site can delete everything you’ve put on its servers any time it wishes. Your account might be hacked or damaged by a malicious person. Matt Kruse, heroic author of Social Fixer, the free browser add-on that eliminates innumerable Facebook annoyances (like hitting Enter for a paragraph and submitting an incomplete post), learned the very hard way that his data on Facebook could be taken from him in a heartbeat. Facebook didn’t like some of the ways in which Kruse enhanced the Facebook experience, so one fine day Kruse and Social Fixer suddenly had no Facebook pages. Thousands of words of Social Fixer documentation written clearly and coherently by Kruse; uncountable more solutions contributed by over 1.5 million Social Fixer group members; the relationships between Kruse and those members; and everything else that makes a thriving online community were lost – or, rather, held hostage. Kruse was pretty much forced to remove some features from Social Fixer that Facebook didn't like, chief among them the ability to see who unfriended you. It was a victory for corporate arrogance and a defeat for little guys who fix and improve what corporations put out half-baked. But Kruse got his intellectual property back. Facebook provides a backup method that is serviceable but crude (like everything on Facebook that doesn’t make money for Zuckerberg). There are three sets of data you can download; the first is what most people will care about, the others are mainly of interest to legal investigators. To download all of your Timeline, private messages, photos, everything you have shared and more, click on Facebook’s “gear” icon in the upper-right corner of any Facebook screen. Then click on “Account Settings.” At the bottom of the resulting page you will see a link labeled “download a copy of your Facebook data.” That’s where you want to click to start the archiving of your data in a ZIP file. When the archive is ready, Facebook will give you a link from which you can download it. When you have saved the ZIP archive to your local drive, you can expand its contents into a folder with subfolders. Your browser can read the index.htm file that will display crude links to different types of your data. The “ads” mentioned last are not ads to which you have been exposed but ads which you may have created and paid Facebook to shove into other members’ faces. The archiving is crude, as I said. Text files and images that appeared together on Facebook can only be displayed separately in archive view. You can see the caption of an image and comments about it, but not the image. Or you can look at images and their metadata but you won’t see what was written about them. Text is unformatted so lengthy posts appear as walls of text without paragraphing. The “Friends” link provides access to interesting information you cannot see on Facebook. For example, a list of the Facebook names of everyone you have “removed” or “un-friended” is available, along with names of everyone who has never accepted friendship requests you have sent. The latter is something you might want to check from time to time. You can also check who has been filtered from your News Feed so that they don’t flood it with obnoxious JPEGs they swiped from someone else, and give interesting parties a second chance if you wish. So Facebook’s backup system does have some utility beyond what’s available on Facebook itself. Instagram, now property of Facebook, does not provide a backup function but a third-party service does. Instaport can download not only Instagram photos but also image stored on Facebook and Flickr; more targets are planned in the future..
Twitter has a similar archive feature hidden in a similar way. On any Twitter page, click the gear icon and select “settings.” You will probably have to scroll down a page to find the “request your archive” button. You will receive an email when your ZIP file of Tweets is ready to download. In addition to an HTML interface to your Tweets, you will also receive a .CSV file suitable for importing Tweets into a spreadsheet or database program, and another data file used by programmers who access the Twitter API. Google+ does things a bit differently, as usual. Click on your profile picture in the upper-right and then click “Account.” Click “download your data” and you will have many options. You can download everything or select specific Google services whose contents you wish to back up. Note that "everything" includes your Google profile, Contacts, Google Drive, Google Voice, pretty much everything from Google+, and your YouTube account data. But curiously, not your Gmail. However, I found a great little program called Gmvault that can back up your Gmail messages to your hard drive. It even has the ability restore them to your Gmail account if needed. Gmvault works on Windows, Mac OS X, and Linux computers. SocialSafe is a fairly comprehensive and user-friendly solution to back up your data from multiple social media accounts. 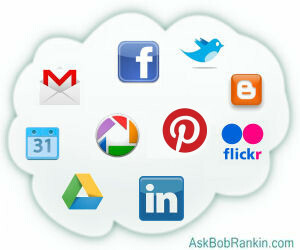 It supports Facebook, Twitter, Instagram, LinkedIn, Google+, Pinterest, Flickr and blogs. SocialSafe compiles all your postings, conversations, photos, and contacts in a "story" format that easy to browse and search. It does a good job of backing up your social media stuff, but it lacks the ability to restore it to any of those services. SocialSafe is not free, but at about $7/year, it's pretty cheap. You can try it free for 60 days. One more service you should know about is Backupify, a cloud-based backup service that can automatically back up your Gmail, Google Drive, Google Calendar, Google Sites, Google Contacts, Facebook Pages and Twitter accounts. One unique feature of Backupify is that it can also RESTORE your data if your Google account is hacked, deleted or otherwise corrupted. Restore is not available for Facebook, Twitter and other types of accounts. There's a free version, which has some limitations, and paid versions starting at $5/month. Most recent comments on "Back Up Your Social Media and Webmail"
Well, clicking on Account didn't work. I got a file called 'error'. GMVault only gives me a DOS shell. Help???? EDITOR'S NOTE: See http://gmvault.org/install.html for instructions. How about backing up webmail from Outlook.com? EDITOR'S NOTE: Yeah, how about it? Microsoft?? I am not a digital "socialite" but I do value my communications with those whom I know but via emails that I already know is soooooooo 20th century! In the case of locally backing up email correspondences; I rely on the PAYware mail program that is part of Microsoft Office 2010, which is "Outlook". I fetch my emails (and contacts/calendars/etc.) from my online email (server) accounts and store them on my local hard drive. I've used MailStore to backup my Gmail account. It allows you to access your emails backed up on your hard drive, where everything is stored (I use an external HD). Best of all, it can update your email folders easily without duplication and is free (so far!). What happened to youur earlier recommendation for MailStore? No longer recommended? If so, why not? What's changed? Actually there is a classic way to backup any e-mail through e-mail client and pop3 protocol. E-mail client could be Outlook, Thunderbird, Sylphide, The Bat, etc. All of them save e-mails in one standard file or as separate files on your local hard drive depending on your needs or program features. The only caveat could be access to pop3. For example, Yahoo mail gives this access for upgraded accounts only (for some money, of course). But there are ways to bypass that through smart scripts. It requires some work, but it pays back. I used to use them when Internet access wasn't unlimited, but always left copies at the server, actually using it as a backup. With unlimited mailbox for Yahoo mail it works perfectly. I think, now, the only reason to backup mail box content and contacts book is for a case somebody hacks your account and you lose it. It can sound a little paranoid, but with all recent legislative changes and scandals with government access to private info, I'd better avoid to keep my contacts info anywhere except places I have complete control of, like local hard drives or even paper notebooks. Maybe even cell phone phonebook is better, since there are a lot of programs to backup it as well. I know, there is a feature to synchronize it with Google account for Android or some cloud service by Apple, but it again stores personal info with potential legitimate access of government or other companies (by the way - did you read the agreement how a company what service you agree to use can use it itself?). Of course, you can lose your cell, it could be stolen, but somebody also can steal your computer or hard drive from your home as well. Also any local backup can be destroyed by an accident from a leaking water pipe to hurricane or earthquake or another world war or giant asteroid that breaks Earth to pieces. Obviously after you realize all those possibilities you barely would be too nervous about backup all your preciouses from Facebook, Instagram, Google+, Twitter or whatever. Unless you know a way to access them from "other side". gmvault did not work on Mac with Mavericks OS. Great article (as usual)I've been a subscriber since Tourbus days, in fact I remember the "contest" you had for the bus logo. Is there any way to back up my Yahoo mail account. I've been sending emails to it for years for storage from my IPS mail. 1) You can use Mozilla ThunderBird to locally fetch/backup your gmail account, using >pop.gmail.com 2) Ditto for Outlook.com and hotmail.com >pop3.live.com 3) Yahoo Mail POP servers are an on-again off-again situation and currently can be offloaded from their servers via their POP server address of >pop.mail.yahoo.com SMTP (local creation of outgoing messages) via a local Email client (e.g. Mozilla ThunderBird) requires additional settings but can be easily retrieved via a simple google search for SMTP server names. Bob ... You have done it, again! Made me think, about issues, that I wasn't aware of. It hasn't crossed my mind, to think about "protecting" all of those pictures and videos of my grand kids and great grand kids. Since, emails are mainly a 'thing of the past', for personal use ... I want to keep the important pictures and videos of what has been put on my Facebook pages. I am not to worried about my email accounts, since, my are for personal use, not business use. Business usage, is a whole different "ball game.!" The need to protect, vital information is paramount. MailStore looks pretty good, for backing up emails. I was impressed, with what the Website had to say, about their product. In all honesty ... My Space was one of the first to start, the whole trend of Social Media and commenting on 'your' webpage to communicate to all of your family and friends, thereby lessening the usage of emailing. Then, Facebook came along and it just ran rampant, across the whole Internet and basically, the world. So, the need to "backup" all of your pictures and videos, and those items put on your Facebook pages, is a necessary these days. In "checking" out, the programs you have listed, meaning I only looked at their websites ... I personally think, the best of the lot is SocialSafe. It looks like it will "cover" what I want to backup personally. I don't do Instagram. I prefer Flickr and have used it for years. I probably like Flickr, because I know how to use it. Though, I think, if, you get the "paid" version of Flickr, you get a lot more storage and your pictures are "safe". Anyway, this is what my oldest daughter, told me, since she has a gazillion pictures on Flickr and uses Flickr for her storage. Yes, Flickr, like anything else on the Web, your account can be "hacked", that simply is a fact and reality. It appears that mailstore.com is no longer free. Mailstore home is free for personal use. Bob ... MailStore does have a FREE version. You just have to look for the MailStore Home, which is listed at the bottom of the Main Page, for MailStore. Bottom line, they are promoting their MailStore Server, for Business', since that is where they make their money, to provide for the FREE version, for Home/Personal use ONLY! Latest version listed for gmvault would not book on my Win7. A slightly older version did book, sort of, then screen went black and cntrl-alt-del did not funtion. Power switched off and 1 yr old HP desktop took a long time to start up, 2-3x normal. None of my virus checkers lit up. This is a buggy site if not malicious.